Bulging discs are often thought to be the same as herniated discs but that is incorrect. A herniated disc involves a crack in the disc’s outer layer. This is called an annulus. Typically, a small part of the disc is affected, allowing the soft material that makes up the nucleus pulposus to protrude. This is different from a bulging disc because, unlike a herniated disc, there is no crack. The disc bulges out of the space but it doesn’t crack and no material protrudes. It also affects more areas of the disc than a herniated disc. 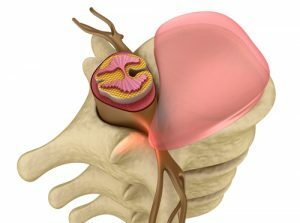 While a herniated disc is likely more painful, a bulging disc can also cause pain that can increase over time. A bulging disc is often diagnosed by a combination of several methods. A physical exam, along with a full history of the problem will often lead to tests like MRI, x-ray, and myelogram with a CT scan. From there, your doctor will work with you to find the best course of treatment. Leawood Chiropractic is a preferred treatment method for many patients with bulging disc because it is non-invasive and does not involve drugs or injections. Once you have your diagnosis, you and your Leawood chiropractor can work together to find the best way to treat your condition. Your Leawood chiropractor will want to verify your diagnosis, so you may go through questions about your medical history, a physical examination, and tests that involve nerve function, reflexes, and muscle tone. Your chiropractor may also order MRI or x-ray scans, as well as other diagnostic testing in order to get a better picture of what is going on. One of the most popular features of chiropractic care is the whole body approach to wellness. Your chiropractor will look at your entire spine, not just the area that is in pain. They will treat your entire spine and provide self-care direction, exercise, and nutritional recommendations so that you can continue to progress and live pain-free. Your pain and spinal problems could be the result of spinal misalignment. Therefore, your chiropractor will seek to get to the root of the problem and treat your entire spine so that you have less pain, your spine can heal, and you have better mobility. Chiropractic for bulging discs is safe, effective, and long lasting. If you are having back pain from a bulging disc, you owe it to yourself to seek quality chiropractic care so that you can enjoy less pain, improved mobility, and better quality of life. Call your Leawood chiropractor today at 913-681-7757.